A-1 Challenge ladies team will bring a new dimension to their outreach programs next year when they set up a basketball court in Bugolobi flats to empower the over 500 youth in that community. This follows a partnership that the twenty-year old club entered with online betting company 1xbet who offered an initial sh10m for the project with more expected next year. 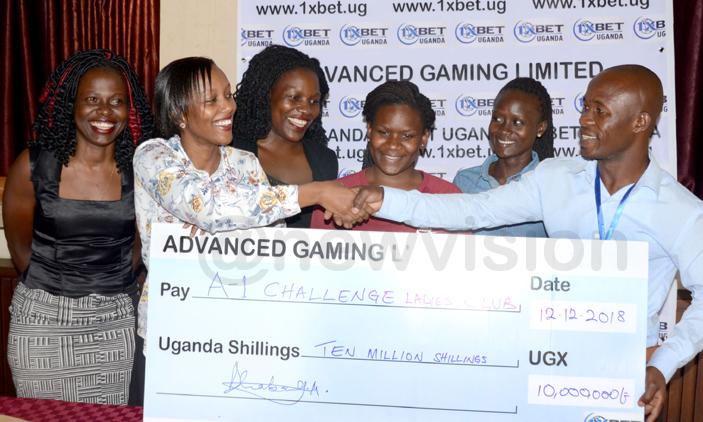 Addressing a press conference at Lugogo on Wednesday, Anthony Dhabanyi, the Operations Manager 1xbet said they had decided to fund A-1 activities because they share the same objectives as far as theit corporate social responsibility was concerned. “We started off with sh10m and next year we shall continue with this partnership as we continue to build our relationship; we hope to do more depending on how these funds will be utilized in a bid to empower more youth,” Dhabanyi said. Carol Kisukye, the team manager A-1 Ladies Club said the funds will be used to build and or refurbish basketball facilities for the promotion of the game of basketball and that with such facilities they will then carry out life skills programs not only to empower the youth take on sport and learn basketball skills but also in the process develop the game. “It’s a great partnership and we know that the contribution will help us impart life skills sessions too. We will start immediately and we hope everything will be set starting next month. We would like to thank 1xbet for chosing and funding us; it is good to know that we share the same objectives of developing the youth, imparting life skill and we are looking to a fruitful relationship with them,” Kisukye stated. A-1 has over the years empowered the girl child in many parts of the country where they have also scouted players like Abigail Abe, Maria Angole, Kamwada Babi and Ramla Ali that they intend to recruit and deploy ion the National Basketball League next year.